Their “tomorrow” lasted two weeks. I’m positive they weren’t organized. But fear not! I have an internship tomorrow with a major newspaper company IN ENGLISH!!!!!!! As French has far too many grammar rules, I prefer writing in English. I think it’s impossible to be completely perfect in French. Why? In past century, someone decided to make everyone start adding random “e”s and “s”s to the ends of some words even though they’re not pronounced just to complicate things… and to show plural and feminine words… but mostly just to complicate things. For example? Envoyé , envoyée, envoyés, envoyées are all pronounced the same way, but if you don’t have the proper ending, it’s wrong. And someone decided to make this rule for fun. Probably someone who was really bored and had the time a lot of time on his hands. And no girlfriend. Or boyfriend. Of course, I’m not a fan of masculine and feminine nouns either. I want all my words to be equal and not be judged by their gender. This is generally the reason I give when my teachers tell me that I’m using the wrong gender. It’s never worked as an excuse. But anyway, the newspaper job will be in English! If that doesn’t work out, I have another job opportunity also in English (that my internship person assured me was mine for the taking if I don’t like the newspaper one). Regardless, I WILL HAVE AN INTERNSHIP IN A WEEK AND A HALF!!!!! Deep sigh of relief. I was at the Louvre on a random Wednesday right before closing, so there weren’t many tourists. (Note: This rarely occurs. Normally this wall has a zoo in front of it.) I like the bullet proof glass and the fact that she has her own wall. She also has her own guard, precautions all courtesy of an Italian attempt to bring it back to their country (by stealing it… gotta love the Italians). 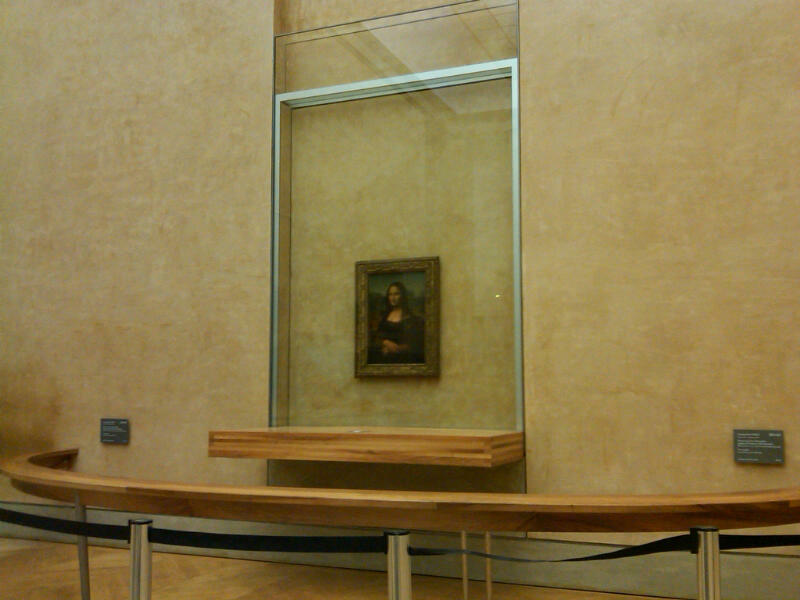 Little known fact: The painting was named for Lisa del Giocondo… this is a prominent theory. Through UV rays or x-rays or infrared rays or whatever types of rays they were doing on the painting (I would make an awesome scientist), they just found that she originally had a hat painted on her head. This would have fit in with traditional maternity wear of that time period, solidifying this theory, as the painting was commissioned in honor of the birth of her second son. I don’t know that they’ve let out the information about the hat yet, but you all now have insider Louvre info. It definitely wasn’t on wikipedia. Enjoy being smarter than everyone who only uses wikipedia as their source of information. Pain au chocolat count: 50… fail. Thats interesting about Mona Lisa! You cannot be a feminist and speak French. I tried to tell you, French is a ridiculous language, but you just had to ignore my warnings.